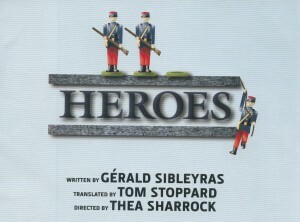 It's hard to believe that HEROES, now in its U.S. premiere at the Geffen Playhouse, was a success in Paris and London (where it won an award for Best New Comedy). Written by French playwright, Gerald Sibleyras, then translated into English by Tom Stoppard, the play stars Richard Benjamin, Len Cariou and George Segal as three crusty WW I vets living out their last years in a Catholic retirement home. They meet daily on its terrace to talk...and talk...and talk. HEROES is a play without a plot, without urgency, without drive or suspense of any kind. It tries to get by on character, atmosphere and humor, the way Beckett does in Godot, but Sibleyras is no Beckett. He is not even Neil Simon. Death is the unifying force in the play. It hovers over the men, who suffer from constant reminders of their own mortality--failing eyesight, fainting spells, grumpiness, boredom, loneliness, suicide of friends. They dream of better times, when they were young and vigorous, soldiers with a mission, hooked up with women; they also yearn to break out of the hospital, climb into the hills and once again see the "wind in the willows" (the original French title). HEROES might have worked better if Benjamin, Cariou and Segal had turned in better performances. But all three seem uncomfortable in their roles, hesitant, unsure of lines. Thea Sharrock's direction is equally forced and uninspired. Only the production values--set by Robert Jones, lighting by Howard Harrison--are deserving of high praise. It takes a heroic effort to sit through HEROES.